As usual, Tom's got himself a new toy - and this time it's a million volt stun gun. But also as usual, he wants to see what happens to it when it goes up against the 300 mph blades of the Blendtec Total Blender. And good for Tom. Personally, I think tasers (and the forces who use them) have gotten way out of control these days. They're being used unnecessarily, and too many people have died from these supposedly "non-lethal" devices. Here's a recent example (video) involving Robert Dziekański, a 40-year-old Polish immigrant who was emigrating to Canada to join his mother, Zofia Cisowski. He spoke no English and had never flown before. And sadly, he and his mother were never reunited. before she emigrated to Canada. 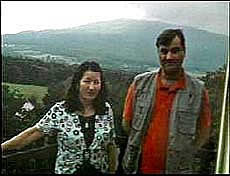 Robert Dziekański, while waiting for his mother to pick him up, was tasered to death in Vancouver International Airport in Canada by the Royal Canadian Mounted Police. 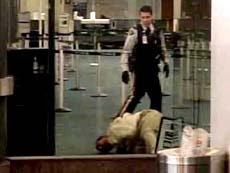 He died of massive failure from being tasered repeatedly and then restrained on the airport floor by the RCMP officers. His death was the sixteenth (16th) death following the police use of tasers in Canada since 2003. Sadly, even though the RCMP officers were well aware that Dziekański didn't speak a word of English, they made no attempts to accommodate him in that regard. They simply walked up to him, exchanged a few words, and began to taser him - several times. And what's just as disgusting is that when they finally realized he had no pulse or heartbeat, not one of the RCMP officers attempted CPR. They just waited there calmly for the paramedics to arrive - a full 15 minutes later. Prior to the video's release to the public, the RCMP repeatedly claimed that only three officers were at the scene. However, there were actually four officers who arrived at the scene, as the video clearly shows. The RCMP also claimed that they chose not to use pepper spray because of the risk it would have posed to bystanders. The video, however, shows that the incident occurred in a separate room, well away from any bystanders. An RCMP spokesperson also stated that batons were not used because of how it would look to the public. This again, was proven to be entirely false by the video. We're just lucky to have the video as proof of this tragedy. The police initially tried to conceal that, too. It wasn't until after Paul Pritchard (the video's owner) had hired an attorney and alerted the media that the video was finally returned to him. The first time around, the RCMP returned his camera with a new memory card, stating that they wouldn't release the video in order to preserve the "integrity" of the investigation. LOL. Lying scumbags. Read the full story of the Robert Dziekański taser incident here and here. It's quite heart-breaking. Aaron Cook Dot Com - Social, Social, Social!